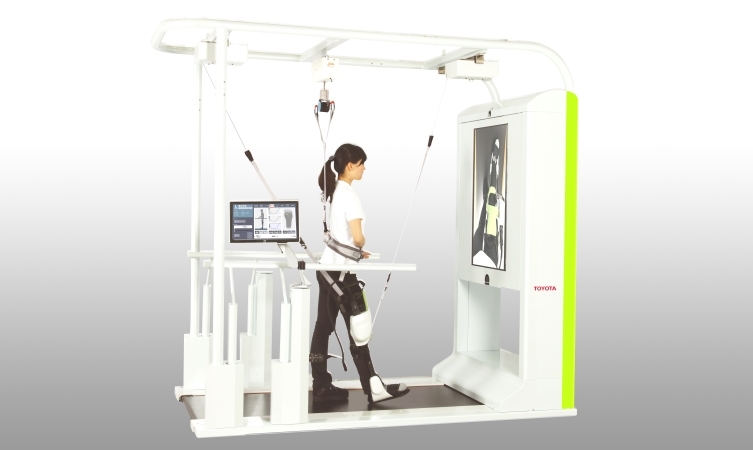 Toyota Motor Corporation (TMC) has begun a partnership with Japanese hospitals to conduct clinical trials of two rehabilitation-aid partner robots, the ‘Walk Training Assist’ and ‘Balance Training Assist’. Both robots are designed to help in the rehabilitation of patients who find it difficult to walk or maintain their balance, often as the result of an illness of injury. The Walk Training Assist partner robot is specifically aimed at helping patients who experience lower limb paralysis that prevents them from walking. The Toyota-developed partner robot achieves this by assisting movement of the lower limb – helping it to swing – and maintaining the stability of the knee joint, with varying degrees of assistance based on the patient’s level of rehabilitation. Patients using the Walk Training Assist also benefit from the system’s large display that monitors body angle and foot placement. See the system in use in the video below. The Balance Training Assist robot helps patients to regain balance control and confidence by introducing a gaming interface that makes the process enjoyable. With the patient stood on the two-wheeled Winglet controller, they can move the on-screen avatar in each of the three games that address an individual aspect of balance control; tennis improves forward-backward movement, skiing focuses on leg-to-leg weight shifting, and rodeo aids centre-of-gravity control. The Balance Training Assist robot automatically sets the difficulty level of each game according to the patient’s ability – watch it in action below. A total of 34 medical facilities across Japan will be lent the robots, which began development in 2007 and started pilot testing in 2011. Since 2011, the robots have been improved ready for this new phase of clinical trials that will further evaluate the effectiveness of the two robots. TMC is accelerating development of the partner robots with the aim of making them commercially available to a much wider range of healthcare facilities at the earliest opportunity. The rehabilitation-aid partner robots the latest example of Toyota’s philosophy of ‘mobility for all’, a long-standing tradition within the company that can be traced back to TMC founder Kiichiro Toyoda. Other personal mobility initiatives include the Toyota i-Road trial that is taking place in Grenoble, France – read more here.